Staff Sgt. Paul A. Sweeney was a Special Forces communications sergeant assigned to Company A, 3rd Battalion, 3rd Special Forces Group (Airborne) at Fort Bragg, N.C. He was killed Oct. 30, 2003 when his unit was ambushed while on patrol north of Musa, Qalax in Afghanistan. 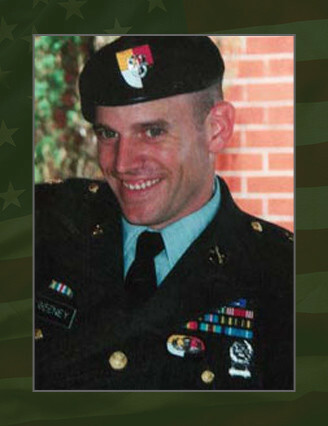 Sweeney was a native of Lakeville, Pa., and joined the Army in July 1991. In September 2000, he attended the Special Forces Assessment and Selection Course and went on to attend the Special Forces Qualification Course, completing the Special Forces Communications Sergeant’s Course in 2001. Before joining Special Forces, Sweeney was assigned as a Bradley fighting vehicle crewmember at Fort Lewis, Wash., camps Casey and Humphreys in the Republic of Korea and Fort Hood, Texas. His awards and decorations include the Army Commendation Medal, the Army Achievement Medal, the Good Conduct Medal, the National Defense Service Ribbon, the Army Service Ribbon, the Overseas Service Ribbon, the Expert Infantryman Badge, the Parachutist Badge and the Special Forces tab. Sweeney was a graduate of the Primary Leadership Development and Basic Noncommissioned Officer courses and the Basic Airborne Course. He also earned the Special Forces Tab and the Parachutist Badge. Sweeney is survived by his wife, Kristen, and two sons, Ryan and Sean. His father, Thomas Sweeney, lives in Kissimmee, Fla., and his mother, Janet Bowen, resides in Lakeville, Pa.
Sweeney was posthumously awarded the Purple Heart.